It was a wonderful run. 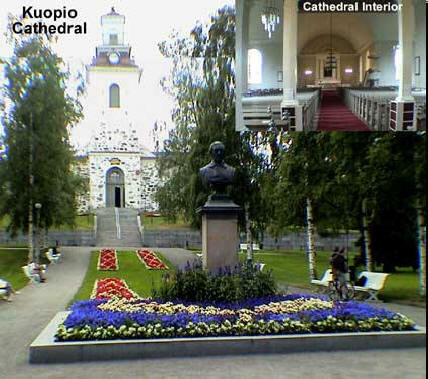 I kept wandering until I found the main plaza of Kuopio. 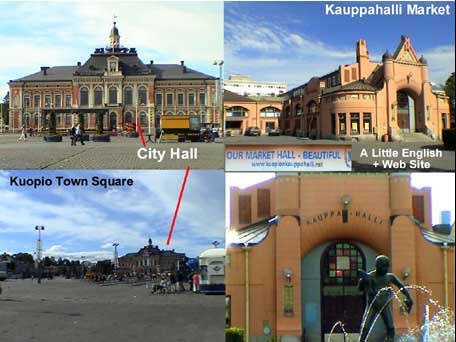 The plaza is one very huge parking lot with the impressive classical City Hall building on the north end (left side above) and the ancient Kauppahalli Market building anchoring the south end (right side above.) The market has a sign in English saying it is “beautiful” and directing you to a website. Too bad it was closed already. The east and west sides of the plaza are formed by long rows of stores and shops, all quite modern. I went into the huge shopping center on the west side which required taking an escalator to the second floor – it was huge. It provided great panorama shots of the plaza. They had large brushes for scrapping snow off your shoes (above right.) Notice the length of the street names on the signs. There is a little hotel and a gift shop next to the tower. We paid the fee and got on the elevator to the top of the tower and it was really worth it. 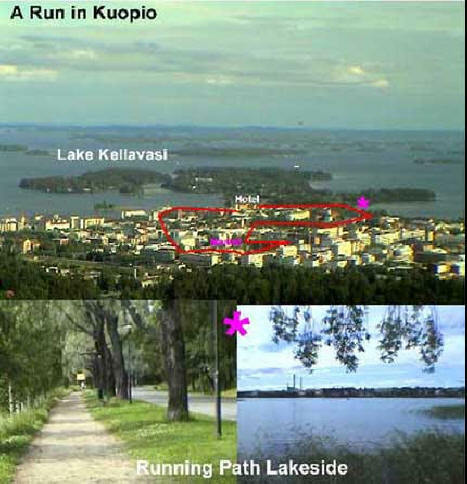 We could see the entire connecting lake region, the city of Kuopio and the surrounding forests. 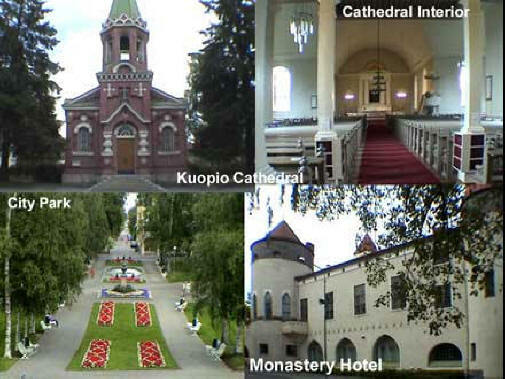 At 6:20, I drove the 86 miles southwest to Jyvaskyla [YUH-vash-kuhl-lah,] a major city and intersection. 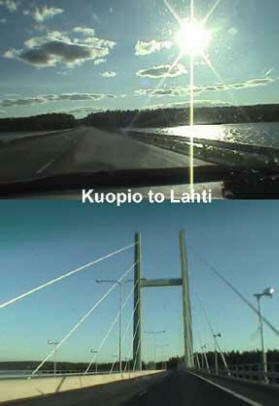 At 7:40 we stopped near there (Vaajakoski) at the ABC freeway car stop and had a snack and fluids for us and the BMW. 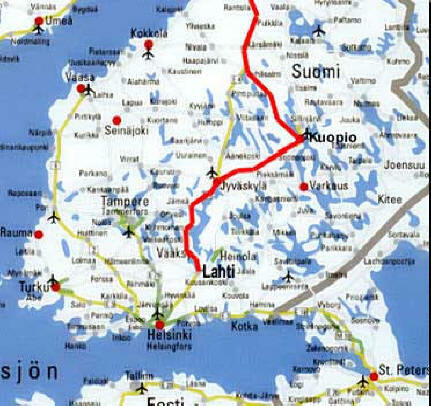 At 7:55 Marcia drove south the remaining 100 miles to our destination of the city of Lahti, 65 miles north of Helsinki. 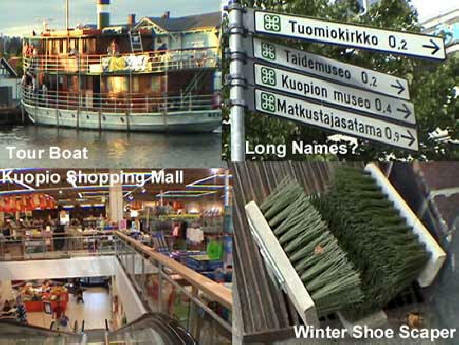 It is a city of 95,000 and basically a satellite of Helsinki, making it more modern and businesslike than other lake cities. It is also known as a skiing center. 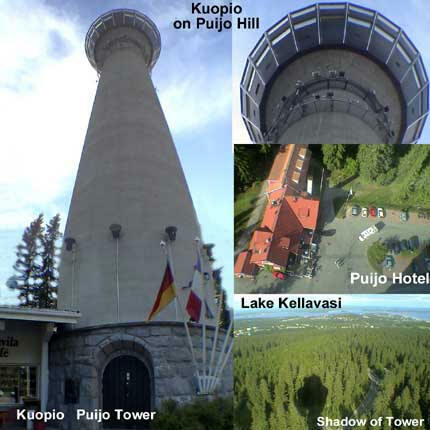 We arrived in Lahti at 9:30 PM and checked into the Hotel Cumulus [Vapaudenkatu 24, +358-381-3711.] Driving around the downtown area, it did not seem to be a lively dining town especially this late. 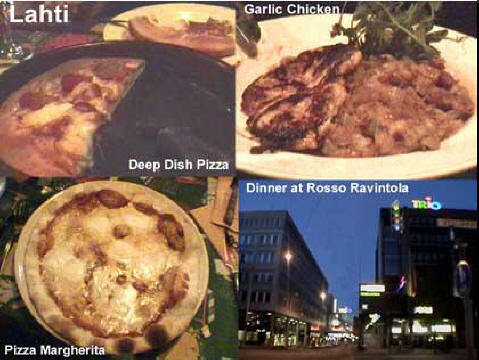 I asked the man at the hotel desk for advice and we walked the three blocks to the place he recommended called Rosso Ravintola (another Finnish chain.) It was 10:15 when we got there and we were lucky they were still serving. I had a Koff beer and then we shared a bottle of Italian Orvieto Classico wine (my favorite; this place is civilized.) Marcia had the garlic chicken while I had a pizza Margherita followed by a deep dish pizza. I was really in the mood for pizza. They were both great. Our waitress was Päivi Kartono and after dinner she invited us to a party later that week at her place in a nearby resort area. We told her we would try to make it. We finished dinner at 11:45 and ambled back to the hotel but we came across a Finnish brew house called Teerenpeli Bar Panimoravintola [, +358-.] We went in for after dinner drinks. Marcia had wine called KK-punkku and the bartender (upper right) recommended that I try their special micro brews. I had an Onnenpekka, a Pillipiipario and a Sauhusanttu. They were all pretty good. 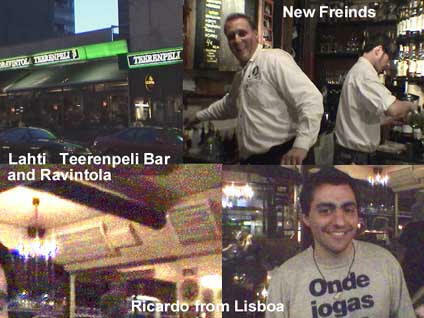 While enjoying the liquid side of Finland we got into a conversation with a nice young fellow from Lisboa, Portugal named Ricardo. We had a wonderful time there but finally had to quit and walk back to our room and got to bed at 3:10 AM.